The big news at the German Grand Prix was that the Honda team was finally ready for action and Ronnie Bucknum was there to drive the new machine. 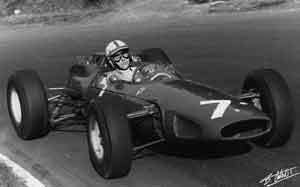 It was not a great success as Bucknum qualified over a minute slower than pole position man John Surtees in the Ferrari. Sharing the front row of the 4-3-4 grid were Jim Clark's Lotus, Dan Gurney's Brabham and the second Ferrari of Lorenzo Bandini. Graham Hill was down on the second row with Jack Brabham's Brabham and Bruce McLaren's Cooper, while the third row consisted of Phil Hill's Cooper, Chris Amon in one of the Reg Parnell Racing Lotus-BRMs, Jo Siffert in his private Brabham-BRM and Ritchie Ginther in the second factory BRM. Practice was overshadowed by an accident on Saturday which left Dutch aristocrat Carel Godin de Beaufort with critical injuries after he went off in his outdated Porsche at Bergwerk and hit a tree. At the start of the race Bandini made the best start to take the lead but Clark soon dispensed with the Italian and he was followed past the Ferrari by Gurney and Surtees. Surtees soon overtook Gurney and then Clark and took the lead. The Lotus driver ran into engine trouble and eventually retired and this left Surtees ahead of Gurney and G Hill with Brabham a long way back in fourth place. Gurney then dropped back as his engine overheated. Brabham also ran into trouble with his transmission. Surtees was able to win the race to score Ferrari's first win of the year and G Hill came home second over a minute behind. Bandini claimed third. Godin de Beaufort died on the day after the race.